Have you ever avoided a conversation because the thought of giving the feedback and the possible response from the person was enough to make your stomach knot in fear? When you knew you should say something, but you just didn’t know how? This is the time to dust off your feedback skills and grab a bite of courage before saying what you need to say. One of the things I truly believe is that silence is never golden when comes to this stuff. If you ignore poor performance in your team as a way of trying to keep the peace, you only end up pushing the problem deeper. You embed the poor performance, which then perpetuates and trickles out to other team members. There’s a couple of ways you can tackle these hard conversations. The first comes from a colleague, Phill Boas. Phill’s view of the world is that with writing, we always get a couple of drafts, and yet when we speak we somehow expect that our words are perfect first time every time. Phill suggests that we set up the frame with our team that it’s OK to say, “You know what – that came out wrong. Can I have a second draft of that conversation“? The trick is to have the conversation that it is ok to ask for a “second draft” in our team before things are difficult. You then have a way of taking pressure off yourself when you need to say something challenging. You can always ask for a second draft if your first attempt comes out not quite as smoothly as you would like. Another way is by choosing whether you are going to be specific or general with your feedback. 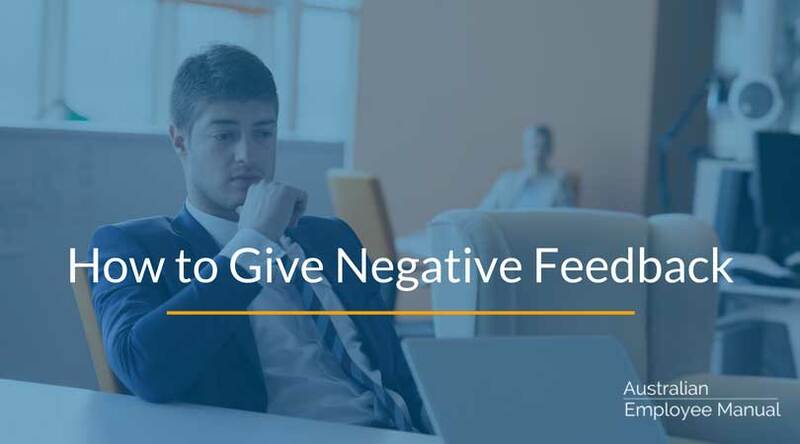 There’s some research that says that people deal best with negative feedback if it is specific to a task and with positive feedback if it relates to a project or general skills or approaches. People find it easier to look at the specific negatives as they relate to the task and not feel as bad about themselves as a person. If you are praising, then generalising your praise helps to boost self-esteem as they apply the generalities to themselves as a person. The key points you want to get across. The number 1 thing you want the person to do better or differently and if you saw them doing it differently, what would you see? The action you want them to take as a result of your communication? What may prevent them from understanding the message the way you meant it? What questions can you ask to ensure that they understand what you have asked or said? How are you going to say what you need to say (tone of voice, gestures etc)? Planning what you are going to say in tough conversations is a key strategy in ensuring that you are heard and understood. But what about when you are struggling to find anything good – and all you really want to do is let fly? The trick with this is to take some time alone and write down exactly what you would like to say – warts and all. You need to get it out of your system, so articulating it on paper (that no one else will read) is the start. You then look at each point and work out how to convert it to the positive. Parents will recognise this strategy – instead of saying, “No you can’t have cookies“, they say, “Yes, you can have some fruit or a drink of cordial“. It also works with adults – instead of saying, “you are a hopeless moron who wouldn’t take responsibility even if you are the last person on earth“, you say, “I am giving you full delegated authority with the XYZ project. What that means is that I want you to design the project, come up with alternatives and give me your recommendations. You will then run them past me for a final check before you are fully responsible and personally accountable for the implementation and the success of the project“. Read more about getting people to take more responsibility. Finally, it pays to find a trusted colleague with whom you can run through what you are going to say. Having a friend listen to your thinking, and suggest where things may be said differently or phrased in a different way, is a powerful way to reduce the fear and knots in your stomach. After all, no golfer gets to the first tee without taking a few practice swings – why should difficult conversations be any different?